A Great Egret hunts for prey in my neighborhood wetland, Glencoe Swale. These beautiful, large wading birds hunt in belly-deep or shallow water. They snare prey by walking slowly or standing still for long periods, waiting for an animal to come within range of their long necks and blade-like bills. 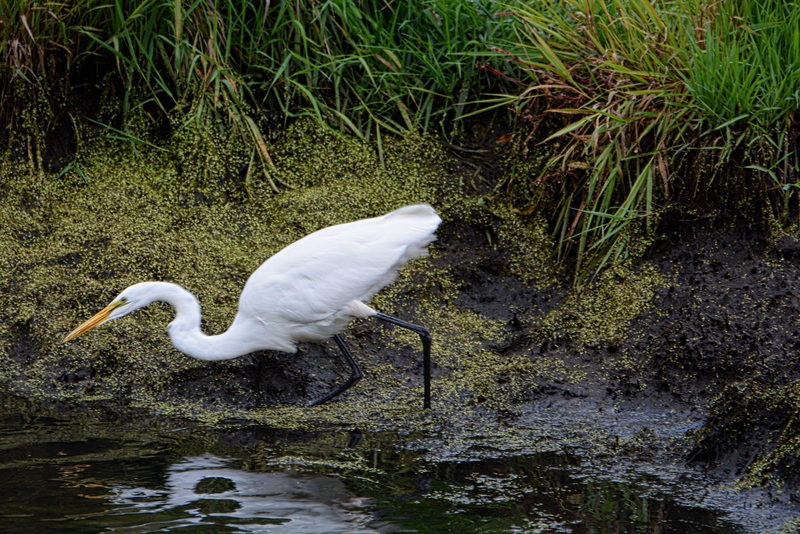 The meal an egret is likely to devour in this wetland includes: small fish, frogs, dragonflies, or small mammals. Waiting for a meal is successful when prey is found and the deathblow is delivered with a quick thrust of the sharp bill… no time for good manners, the meal is swallowed whole. Do you know how to distinguish wading birds? Legs– are long and thin with long, agile toes. This helps with keeping balance in water currents or in unstable muddy ground. Longer legs help with foraging in deeper waters. accommodate changes in posture while hunting. Neck– is long and agile to accommodate changes in posture while hunting. Powerful neck muscles in waders like egrets and herons are used to powerfully spear prey while hunting. Bill– is usually long, and often with specialized shape to assist with efficient foraging. Shape depends on the type of food the bird consumes and may be: sharply pointed, distinctly curved or spatulate. Plumage– on larger wading birds includes elaborate plumage like herons and cranes develop during breeding season… or, be less showy, like rails that are much more camouflaged. Foraging– is a patient behavior. While hunting, wading birds may stand motionless for long stretches of time while waiting for prey to come into reach. When moving, steps are generally slow and deliberate to avoid scaring prey. Wading birds freeze postures when they feel threatened. Communities– can be gregarious and form communal roosts and breeding rookeries. They may also be part of mixed flocks with other wading birds or waterfowl. Vocalization– is quieter than in other groups of birds, although flocks can be relatively noisy. Quiet behavior is essential for stealthy hunting success. Flight– poses in flight help with the identification of wading birds in the air, especially neck position. Some species extend their necks in flight; other contract the neck. They typically have their legs fully extended to the fear, with feet often extending beyond the tail. I enjoyed the descriptive details here in your post Jane. These incredible hunters excel in their practise of stealth and patience. Reading through the characteristics I realised I’ve never heard the call of any of our local heron or egrets – that’s made me curious now to discover their ‘voice’. Liz, I suspect you will be disappointed. They tend to be squawkers… in my opinion. Haha… there must be an app for this! An excellent choice for the week Jane – love watching these beauties so patiently fishing – and loved your capturing it! You are so kind. I hope that WordPress helps to provide a soothing distraction (as safety allows) while you keep a watch on the hurricane update. Fishing birds are the kings/queens of waiting and waiting motionlessly. I love watching them and I love this shot.